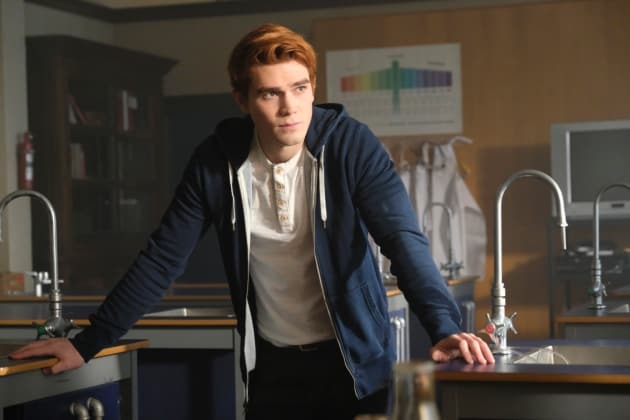 Archie is in too deep within his role as Hiram's intern and Agent Adams' spy. But could things have gone too far for him to get out? 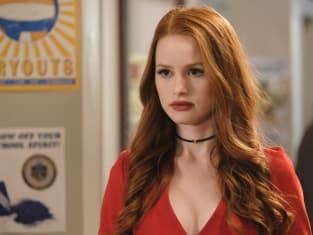 Riverdale Season 2 Episode 13: "Chapter Twenty-Six: The Tell-Tale Heart"
Betty: You lied to us! That shady guy wasn’t one of your customers, he was a drug dealer. It’s all in here, hundreds of messages from junkies looking for a fix, including one from Chic the night of. Alice: Betty, why in God’s name would you go back there? Betty: To make sure in broad daylight that no one could see him from the trail. Alice: Okay, give that back to me before someone tracks that back to the house. Betty: No, Mom, I already turned off the GPS and you’re missing the whole point here. Chic lied to us about the shady guy. What else is he lying about, huh? Betty: Excuse me? Are you kidding me?! NO ONE is buying the waterworks! Permalink: NO ONE is buying the waterworks! Jughead: Jeez, Dad, you reek. FP: It’s sodium-hydroxide. In a week there will be nothing left...nothing but his teeth. Alice: Thank you, FP. I’m sorry for involving Betty, and that she pulled Jughead into this. FP: We take care of our own. The circle ends here. No more loose ends. Permalink: The circle ends here. No more loose ends.